This page contains Sega games catalogues/flyers or pamphlets which used to come with new games. Some also came from the inner packaging of consoles. This list is by no means complete. But it does give a good idea of what these catalogues looked like. 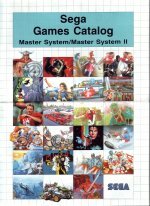 This time the title states Master System/Master System II. This pamphlet showcases new releases such as Ghouls n' Ghosts, Golden Axe Warrior and Castle of Illusion. A very good year to own a Sega Master System. The Sega Games Console for the Master System(1989). This pamphlet showcases new releases such as Golden Axe, Dynamite Dux, Psycho Fox, Galaxy Force, Dead Angle and Ghostbusters. 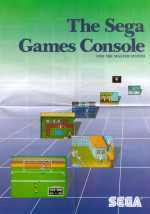 I'm not sure of the date this one was out, this one showcases new releases such as YS, Rastan, Vigilante, Altered Beast, Rampage, Cyborg Hunter, Outrun 3D. 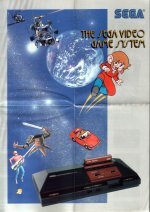 The Cover has Alex Kidd, the Outrun car, Space Harrier, and Thunderblade on it.